Krzszytof Zanussi | WHAT A FEELING! The Polish filmmaker Krzysztof Zanussi is almost unknown in these parts. He’s been making movies—and very good ones—for more than a decade, but outside of specialized circumstances, such as a film series or film festival, his films just haven’t had the chance to be seen. This is almost criminal, because Zanussi’s films are among the most precisely realized movies being made anywhere today. Zanussi was schooled as, of all things, a physicist, and his films have the kind of cool, controlled exterior that lead you to believe they could have been made by a scientist. What’s interesting about Zanussi is that his exteriors are misleading. In Zanussi’s characters, a stubborn, troubled spirit simmers behind a pallid façade, and a restless mind can’t ignore the longings of an all-too-human heart. 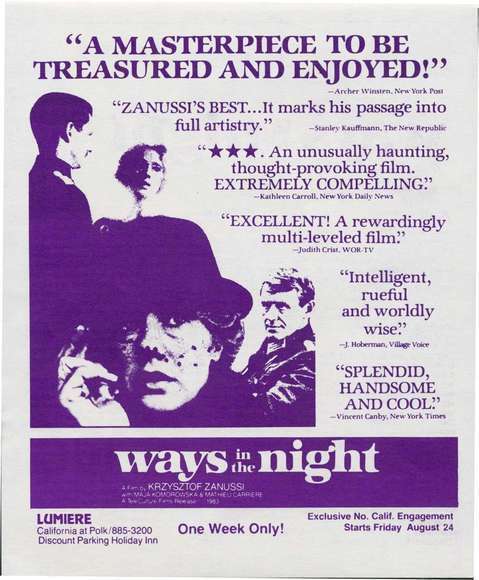 Ways in the Night is a good case in point. It’s set in a small town in occupied Poland during the Second World War. Friedrich (Matthieu Carriere), a young German lieutenant, discusses philosophy with his superior officer (Horst Frank), who is also his cousin. They have airy intellectual arguments about life and death, but Friedrich does not seem much more excited than he would be if they were discussing a game of cards. But when he sees Elzbieta (Maja Komorowska), he becomes tormented. He desires her, and she sees this. When he tries to make polite small talk, she treats him with civilized contempt, and she turns his longing for her against him, as she flagrantly disobeys the rules of the Occupation. Their battle lines are not as clearly drawn as it might seem, for soon you wind up feeling sympathy for Friedrich during his crisis. As his dormant human feelings surface, his military career becomes a shambles. Pulled in different directions, and paralyzed by the hesitation he feels as a newly thoughtful person, he is racked by doubt—and by the feelings he still has for Elzbieta. Zanussi creates an exquisitely delicate atmosphere in this film, which makes it all the more startling when passions break the surface. And the framing device at the beginning and ending gives a sense of history circling around itself. The film’s final, eerie moments go beyond poetic justice; it’s as though the final chord of a concerto were being played, after a 30-year delay since the previous note. Apparently Zanussi has left Poland; this film is a German production. But no matter where he makes movies, he’s always a compelling director. Let’s hope that distribution of his work becomes a bit more commonplace; based on the evidence so far, he’s going to come out of this decade as one of the very best filmmakers we have. The film was released in the U.S. about five years after Zanussi made it. The late Seventies-early Eighties were a good period for his films actually being seen here, but he’s made about thirty films since 1984’s beautiful Year of the Quiet Sun, and very few of them have seen the light in the U.S. beyond the occasional festival. So my hopeful suggestion at the last paragraph came to a zilch by that yardstick. Really curious about a film he made in 2009, Revisited, which appears to be an inquiry into his former actors, including his plain-faced goddess, Maja Komorowska.